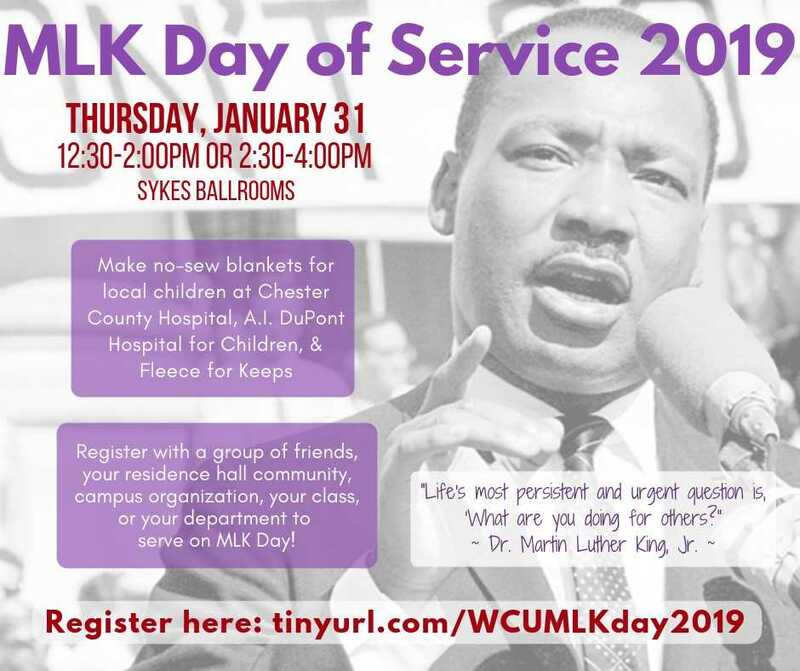 The Office of Service-Learning and Volunteer Programs invites you to join us on Thursday, January 31, 2019, for our annual no-sew fleece blanket making service project in observance of Dr. Martin Luther King, Jr. Day. The no-sew blankets will be given to children and adults in need of some extra warmth and care at Chester County Hospital, Nemours A.I. duPont Children's Hospital, and Fleece for Keeps. This year, our session times are 12:30-2pm or 2:30-4pm. To register your club or organization, please go to www.tinyurl.com/WCUMLKday2019. The first 150 people who attend Volunteer Session #1 will receive a FREE snack after completing their blanket as a 'Thank You' for choosing to spend part of your day honoring Dr. King's legacy.